I’m breaking new ground. For the first time in my life, I cooked fish! I actually have a fish allergy, meaning I can’t eat it. I know how healthy it is though, so I was happy to take part in ‘Ready, Steady, Cook Fish! A campaign by Fish is the Dish to encourage the people of Britain to eat more Omega-3 rich fish by promoting its health benefits, along with the wide variety of tasty and convenient ways that it can be enjoyed. 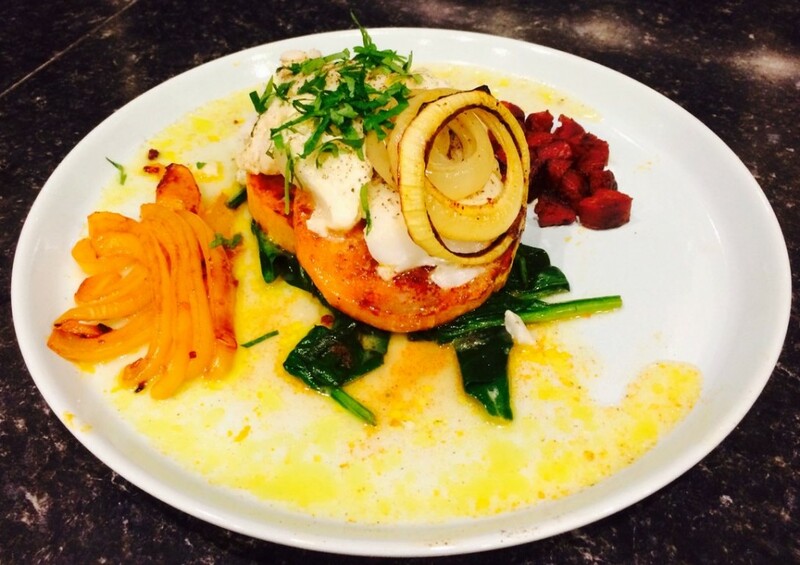 Here is my input – lemon-baked hake with chorizo and vegetables! The whole thing takes less than 30 minutes to cook and according to my test audience, tasted really good! Slice the squash and onion into rings roughly 1cm thick (too thick and they’ll take too long to cook). Lightly coat with oil and sprinkle with a little paprika. Place in the oven at 200 degrees Celsius. Chop the chorizo into small chunks and lightly fry on the lowest heat you can. When some oil has leaked out, add the strips of pepper to the pan and continue to fry on a low heat. The idea is to soften the peppers, but retain as much colour as possible. When the peppers are soft and the chorizo is cooked, remove them from the pan and plate them up. Add a handful of spinach leaves and allow them to wilt (takes a few seconds). This is only done a few seconds before removing the fish and vegetables from the oven. Slice the lemon and lay flat on the tin foil. Place the hake fillet on top. Add a generous knob of butter on top of the fish, season with pepper and throw in a clove of garlic. 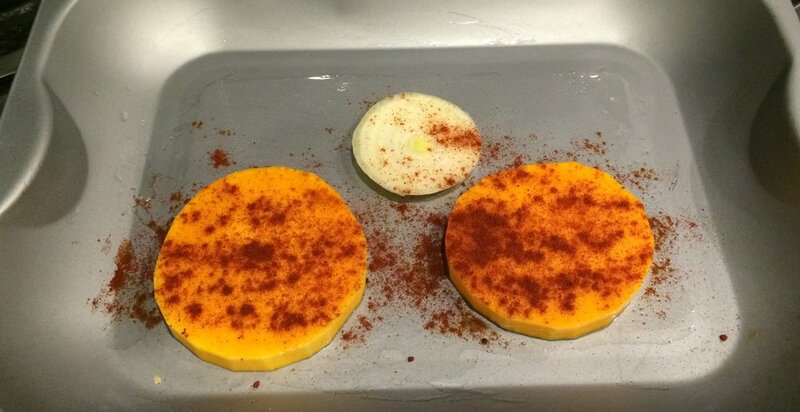 Seal the parcel and add to the oven with the onion and squash, cook for 10 minutes. The melted butter, lemon and garlic all combine to make a sauce for the dish. 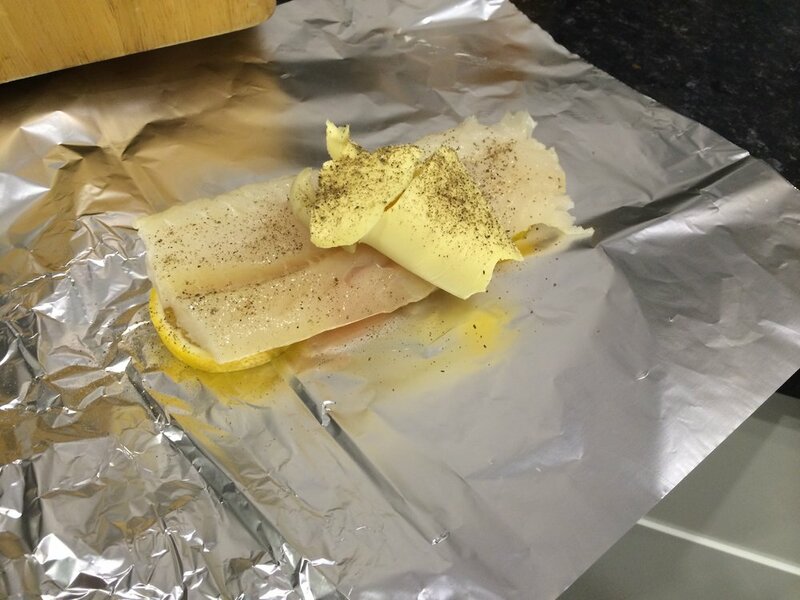 To ensure everything is cook at the same time, the fish should only be added to the oven when the squash and onion have been in the oven for around 15 minutes. Presentation isn’t my strong suit – I’m more of a throw it on the plate kind of guy. This wasn’t much different, but a little ‘artistic’ help from my girlfriend made the dish look slightly prettier! Basically, I piled the peppers and chirzo either side of the plate. In the middle I lay the spinach bed and added the squash discs on top. The fish lay on the squash and the whole thing was garnished with the roasted onion and chopped parsley. The sauce was a butter and lemon juice from the parcel. Simple!